The Chimney is pleased to present “Reverse Subterrestrial”, a solo exhibition by Japanese-born, New York-based artist Yasue Maetake. Through her sculptures and installations, Maetake explores the notion of animated matter, the effect of time, artifact's material essence and its infinite possibilities of forms as well as their adaptability in light of climate and technological change. Upon entering the Chimney’s space, viewers discover an unruly and jungle-like environment: sculptures suspended from the ceiling, a video projected on paper works as well as architectural elements. As one engages with this exhibition, several bodies of works emerge at different length - steel, wood, paper sculptures and fiber reliefs - all coalescing into an interactive and living climate. A multi-level structure invites viewers to experience the exhibition from various angles and altitudes, addressing our connection to Earth’s gravitational constraint. These multiple viewing angles explore the tension between human desire to be released from physical constraints and the instinctive sense of security that we seek from physical laws. Viewers are enticed to find stability and tranquility between these two seemingly opposing forces. Installed on the ceiling, Specks of Green Rust before the Wind, consists of a skeletal-like cane adorned with handmade paper (kozo, abaca and cotton) imbued with wood stains patina and corroded copper. For Maetake, materials are subject to similar behavioral patterns as human, namely ‘affect heuristics’ – a process whereby environmental phenomena generate sensitive reaction in objects that lead them to develop a responding pattern. Seemingly inert objects have a spiritual essence and are in constant motion. These hybrid objects act between life-like forms in state of birth and in total degeneration and engage in a cycle that parallels that of life itself. The works’ surface appear burned, stained, rusted – indicating the artist’s simultaneous desire to retrieve the original rawness of materials and suggest their state of decay. In this ever-consuming waste society, objects’ functions are exploited to their utmost and this depleting cycle accelerates. Can we overcome the constructed hierarchies between the object realm and ourselves? 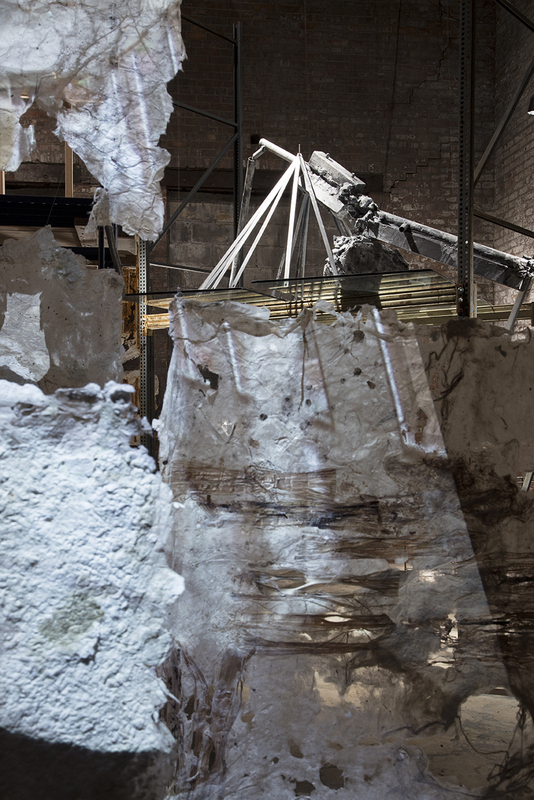 The exhibition “Reverse Subterrestrial” integrates industrial constructions with natural growth: decayed materials are being reborn into an unexpected organic amalgamation. The transient quality of the works suggests the effect of time on objects that exists between the natural realm and the man-made. Yasue Maetake was originally trained in glass engraving, absorbing the importance of physical and optical manipulation, which would have a strong influence on her work. Prior to moving to New York, Maetake attended vocational schools in Japan and the Czech Republic, and apprenticed with a private glass foundry in southern Germany. Today, Maetake’s practice spans sculpture, fiber, collage, and video. She engages in an active sculptural dispute between whether to humanly embrace or to rebelliously challenge materials and form, while creating images that suggest life-like hybrids of form that remind us of manmade construction juxtaposed alongside raw elements of nature. Maetake’s work has been exhibited extensively in the US and abroad at venues including Galerie Fons Welters Project Space, Amsterdam, Netherlands; Harris Lieberman Gallery, New York, NY; Espacio 1414, The Berezdivin Collection, San Juan, Puerto Rico; Queens Art Museum, Queens, NY; and Fredric Snitzer Gallery, Miami, FL. Maetake has been a resident artist in the studio of El Anatsui in Ghana; and has received awards and fellowships including from the Agency for Japanese Cultural Affairs. In the Spring of 2016, Maetake’s work was featured at Hometown, Brooklyn as part of a two-artist exhibition entitled Passing Index. Maetake earned her MFA from Columbia University, New York, NY; and currently lives and works in Queens, NY and is originally from Tokyo, Japan.